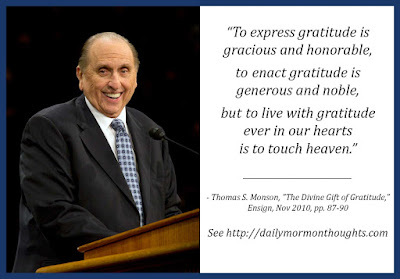 "My brothers and sisters, do we remember to give thanks for the blessings we receive? Sincerely giving thanks not only helps us recognize our blessings, but it also unlocks the doors of heaven and helps us feel God's love. The person who learns to "walk with gratitude" or "live with gratitude" is doubly-blessed. In recognizing and acknowledging blessings, he not only "unlocks the doors of heaven" but learns to "feel God's love." It changes the way we perceive the world around us, and the circumstances of our lives, in a profound way. 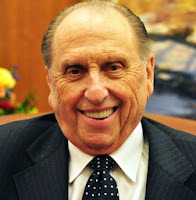 I think President Monson is a wonderful example of this principle. His joyful life of service demonstrates an awareness of who he is in God's eyes, and his deep and sincere gratitude for the blessings he has been given. He truly has touched heaven, and invites us to follow that example.